Wii2HDMI, a converter for the Wii console, outputs video and audio in full digital HDMI format and supports all Wii display modes (NTSC 480i 480p, PAL 576i). Plug and play for true-to-life video/audio effects on your TV/monitor. It can convert the standard Wii output into an HDMI compatible device allowing audio and video to be carried over a single HDMI cable. 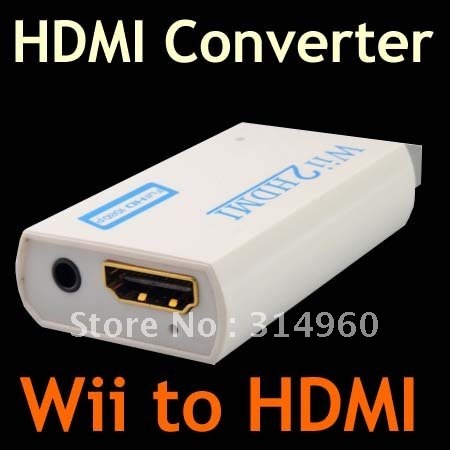 It detects Wii display modes including NTSC 480i, 480p, PAL 576i automatically, and upscales them to HDMI 720P or 1080P. The extra 3.5mm audio socket brings your convenience to connect headphone or speaker. You can enjoy games in night without worrying to disturb others. Video and audio in full digital HDMI format, no transmission loss. Supports all Wii display modes (NTSC 480i 480p, PAL 576i). HDMI upscale to 720p or 1080p high definition output. Provides advanced signal processing with great precision, colors, and resolutions. No power adaptor, no messy cordsÃ¢Â€Â”just one HDMI cable. Output: One HDMI Connector,one 3.5mm Stereo Audio Jack. Supported Video input Mode: Includes all the display modes of the Wii console (480i, 480p, 576i). Supported HDMI output Mode: 720P, 1080P. Size: 75mm × 35mm × 15mm. 1,Please understand what you are bought, you should read our AD,terms and conditions clearly. 2,We`ll post your items out asap after payment confirmed. We'll send package out via air mail within 2KG, package will send by express if more than 2KG. ( The delivery time is about 5-7 working days by EMS ,3-5 business days by DHL,3-5 business days by UPS, 7-21 business days by register mail). 3,We`ll send you the tracking number within 24 hours after item posted out. 8,Pls leave us a positive feedback if you appreciate our item and customer services,We`ll do the same for you. If you have anything you feel unsatisfied with, please do email us. We can try our best to help you. Pls believe us can help you resolve the problem.